A commercial roof coating in Dallas, TX makes the most out of your roof with modern technology and superior performance. With our affordable roof coatings, you can add waterproofing and strengthening qualities to your roof. Make your roof more durable with a roof coating applied by Legends Roofing today! Get started by calling 214-321-3293 . Our customer service representatives will get you set up for a roof coating appointment as soon as possible. Roof coats work by providing further weather and waterproofing, to save you from interior water damage and add energy efficiency to your business structure. If you’ve noticed a growing number roof leakages or energy loss, you don’t necessarily have to go for an expensive roof replacement. Commercial business owners opt for roof coatings as the first step to exterior improvement before a restoration. You can apply a roof coating to an existing roofing system with or without previous coats. Simply have any present damage on your roof repaired and then ask a Legends Roofer to apply some needed roof protection with an energy efficient roof coating. 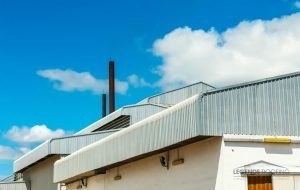 Apply a roof coating to your commercial roof for better energy efficiency and eco-friendly roofing. We exclusively install silicone based coatings for commercial businesses, though you can find a slew of other kinds of roof coatings. Silicone roof coating works best for flat roofed businesses because of its superior defense against water pooling. This means you won’t have to worry about pooled roof water voiding your warranty. Silicone (and many other types of roof coatings) also comes in light reflecting shades that not only add style but do a great job at reflecting sunlight and keeping energy costs low. With so many different kinds of coatings, it’s important to find the one that directly addresses your commercial roofing needs. For Texan businesses, Legends Roofing contractors install coatings with high waterproof abilities to avoid damage from water pooling. We’ll suggest a roof coating that can withstand hail damage and sun damage from our storms and hot weather. Call a Legends Roofing customer service representative if you think it’s time for a roofing restoration or a roof coating in Dallas, TX. With regular roofing service and roofing repairs by Legends Roofing contractors, you can lengthen the lifespan of your flat roof. If you’re ready for a roof coating now, call us at 214-321-3293. Speak with a roofing contractor about silicone and acrylic roof coatings for your business today! Updated on August 4, 2017 at 3:04 pm by Legends Roofing.